I suppose I should be non-partisan and just mention the monumentous America election that is going on today. So I won’t share I personal political views with you. Probably. And it is easier to slow down as a community than as single person. Unless you are a hermit. In which case you are probably already pretty slow and don’t really need to be reading this. SO, as you start to slow down you will, whether you mean to or not, become a Secret Agent of Slow (or SAS, like that?). It is better to lead by example than it is to preach and get all evangelical. 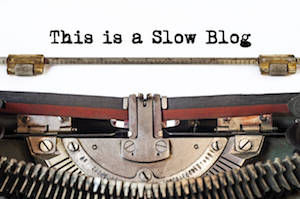 Sure, as you start to see the benefits of slowing down on your life, you will naturally want to tell other people about it. But don’t get all superior and start having “slow off’s” with your friends. That is far too yuppie 80’s dinner party where they showed off about Porsche’s and Rolex’s.